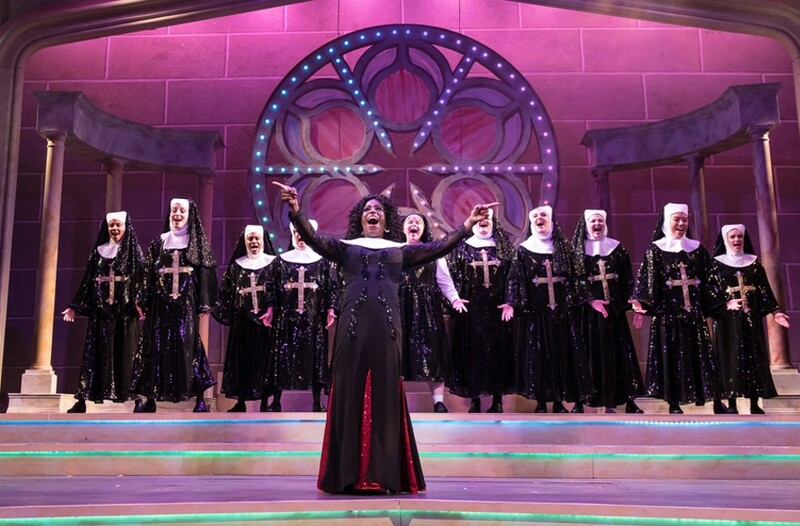 Virginia Rep’s “Sister Act” is a light, fun and funky show | Theater | Style Weekly - Richmond, VA local news, arts, and events. Aaron Sutten Felicia Curry stars in "Sister Act." Is there any authority figure more ripe for parody than a nun? It's more than their stereotypic stern religiosity, or that they've rapped the knuckles of generations of Catholic school youngsters. Even their shape is up for mockery, cloaked forever under the hood of a habit. The gulf between a nun and, say, worldly comedian Whoopi Goldberg, is the size of the Vatican, which is part of what made the 1991 movie "Sister Act" such a big hit. Playing Deloris, a Reno lounge singer hiding out in a San Francisco convent from her mobster boyfriend, Goldberg provided a humorous juxtaposition to the cloistered nuns of the film. After Deloris is put in charge of the convent's choir — and shows them the joy of girl group and Motown hits from the 1960s — the Temptations' "My Girl" sung as "My God" — the parish suddenly becomes popular at the risk of blowing Deloris' cover. In its transition into a musical, now playing at Virginia Repertory Theatre, a few changes have been made. Set in 1978 and moved to Philadelphia, composer Alan Menken has taken the initiative to run wild with the Philadelphia soul sound. The result is a fun and funky show, even if it sometimes lacks the full-blown spark you might hope for. Felicia Curry — who audiences may remember from Virginia Rep's spellbinding "The Color Purple" four years ago — stars as Deloris. Compared to Goldberg's version, she's more friendly than fiery, bringing plenty of charm to the role and shining in her solo, "Sister Act." Curry tackles her character's one-liners with aplomb, but the emphasis here is more on vocal firepower than comedic chops. As her foil, Andrea Rivette is appropriately dour as the parish's domineering mother superior. Her dry character may not get as many punchlines, but Rivette excels in numbers like "Here Within These Walls," emphasizing her attempt to keep the outside world from creeping in. The other nuns get their moments too, including Kelsey Cordrey's cheery Sister Mary Patrick, Susan Sanford's sarcastic Sister Mary Lazarus and Gwynne Wood's sweet Sister Mary Robert. In "When I Find My Baby," mobster boyfriend Curtis (Sincée J. Daniels) sings humorously about wanting to kill Deloris, a reminder that Menken also crafted the darkly comic songs of "Little Shop of Horrors." His henchmen Joey, Pablo and T.J. (Paul S. Major, Mark Parello Jr. and Anthony Cosby) are amusingly faux-seductive in the slow R&B number "Lady in the Long Black Dress," and Durron Marquis Tyre is funny as good-guy policeman Eddie; his "I Could Be That Guy," is a highlight. Director Robin Arthur's choreography is lively, and musical director Anthony Smith makes the most of Menken's bouncy, disco-influenced score with his eight-piece band. B.J. Wilkinson's colorful lighting design works in tandem with Ron Keller's gothic scenic design to bridge the spiritual and the secular, and Sarah Grady's costume design runs with the period, especially with Deloris' costumes. Virginia Rep's "Sister Act" plays through Jan. 6 at the November Theatre, 114 W. Broad St. For information, visit va-rep.org or call 282-2620.